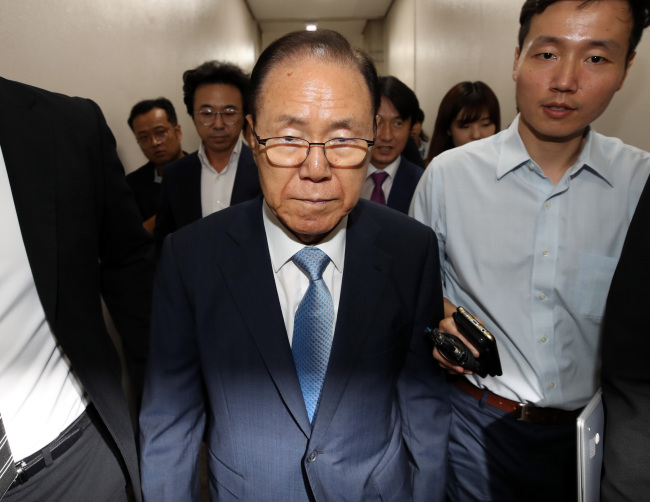 A Seoul court on Thursday cleared a close aide to former President Lee Myung-bak of a bribery charge over his involvement in the spy agency's provisions of off-book funds to the presidential office while Lee was in office. The court handed down the ruling on Kim Paik-joon, a former senior presidential secretary for administrative affairs from 2009-2011. He was indicted in February for accepting 400 million won ($375,000) in bribes from the National Intelligence Service between 2008 and 2012. Prosecutors pressed charges of bribery and loss of state funds against Kim. The court dismissed the latter charge, saying its statute of limitations has run out. Kim, 78, is known as one of the closest aides to Lee and has often been dubbed his "butler." The court found that the NIS money was not bribes, since they were not provided to the president by the NIS seeking any favor, a ruling in line with last week's verdict on the NIS fund case involving Lee's successor and ousted President Park Geun-hye.